There’s history in the name. There’s also belonging. Did you know that our Director, Dan Davis, was once a Seminole? Back in 1983, that’s what we called the Poplar tribe. Dan was a Counselor then and that’s the year he became “Singing Stream” in Council. Three summers later, he became Tribal Director for the Seminoles’ arch-rival at camp, Choctaw. That’s 1986 talk for Sycamore. Actually, all four of the directors have been part of a tribe at one point in their Rockmont history. Stan Wilson (“Dancing Shoulderblades”) was a Counselor and then Tribal Director in Cherokee, Comanche, Apache, and Choctaw between 1980 and 1985. He climbed right on up the mountain with each move! If you lined up all 6 tribes, from youngest to oldest, before the turn of the century, the list would go like this: Cheyenne, Cherokee, Comanche, Apache, Seminole, and Choctaw. Can you imagine calling Birch Lodge something different, like Cherokee Lodge? That may sound interesting to you. But, to be clear, even Stan didn’t call it Cherokee Lodge. He called it Thunderbird, a name you can still see above the entrance to the lodge. Did you know that Shawn Marler (“Modest Monk”) was once a Poplar? Yep, if you go find the 2005 and 2006 photos in the Ship hallway, you’ll see young Counselor Shawn sitting right next to his cabin of campers. How about the fact that Andrew Ginn (“Courageous Captain”) was once a Buckeye Counselor? Twice actually! That was back in 2013 and 2014, a few years before he became the Bear Camp Director. 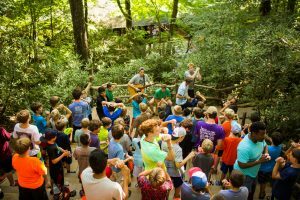 No matter where we come from or what experiences we have had, a tribe is where we all find our first sense of belonging at Rockmont. A tribe plays together and sticks together, whether they win or lose! You don’t have to tackle anything alone when you’re part of a tribe. You’ve got so many people to help you out! You’ve got your cabinmates, your Counselor, and your Tribal Director. And these fellow tribe members are from all over the United States and even from other countries, too! Each person matters in a tribe. Each one is needed to actually make it a tribe. Tribes are proud of who they are! You often hear this in the tribe chants. Do you recognize any of these? “B-U-K-I… BUCKEYE!,” “We are… BIRCH NATION”, “Hick, hick, hooray!”, “Who rock? HEMLOCK!”, “Marco… POPLAR”, “Sycamore… SycaMOST!” And that’s not even scratching the surface. What are some of your favorite tribe chants? What does it mean to you to be part of a tribe? Tell us more about your experience as part of a tribe at rockmont.com/share.